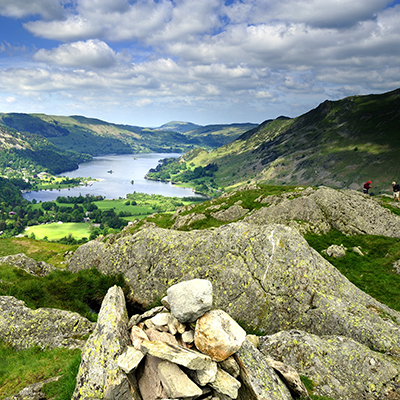 Please find below all our our on-site walking holidays throughout the UK. Can't find what you're looking for? Click here to send us an email and we can put something together just for you. 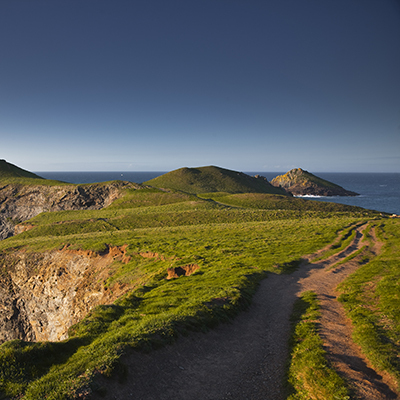 Start your 630 mile experience here; the whole South West Coast Path awaits you. Stunning cliff-tops, glorious waterfalls and wooded valleys offer breath-taking views and numerous photo opportunities as you walk. The Westward Ho! to Padstow section of the South West Coast Path is a journey of contrasts. 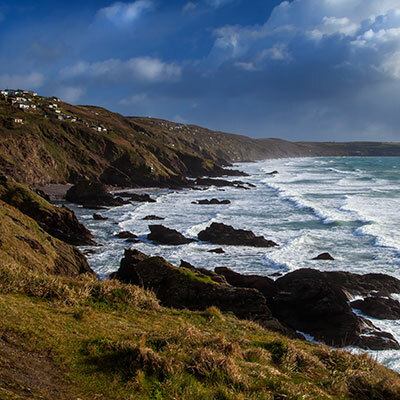 Beginning with sandy beaches, walk on to the stunning but strenuous stretch between Hartland Quay and Bude. 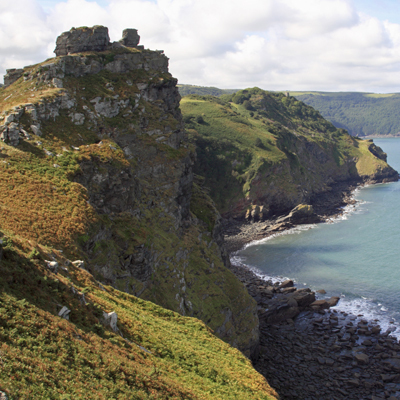 Pass by the rugged imposing remains of King Arthurs legendary cliff-top Castle at Tintagel and un-spoilt fishing villages such as Port Isaac and Boscastle making your way to your journeys end at the bustling fishing port of Padstow. Walking from the picturesque harbour side in the renowned town of Padstow, through the landscape of Cornwalls’ great mining heritage, onto the artistic and cosmopolitan town of St Ives. A mixture of the old and new, with opportunities to sample both culinary and historical delights. Begin your journey in the artistic hub of St Ives, home to the Tate and many numerous independent galleries. This dramatic walk explores many well-known landmarks including Lands End, The Minack Theatre and Marconi Telegraph Museum before reaching your end point in Penzance, home to the iconic St. Michael's Mount. 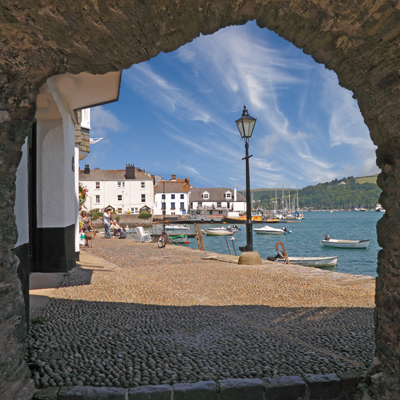 A chance to explore the outstanding diversity of Cornwalls coastline ; from the rugged cliff tops and pretty coves hiding the fishing villages on the stunning The Lizard peninsula, to walking through ancient woodland surrounding the Helford River before reaching your destination in the vibrant harbour town of Falmouth. A walk through the great maritime history of the South West, exploring castles, fortifications and folly’s. Should you wish, there is the opportunity to explore the stunning inland gardens of Heligan and The Eden Project, or explore the literary heartland of Daphne du Maurier or Kenneth Graham. A walk to inspire. 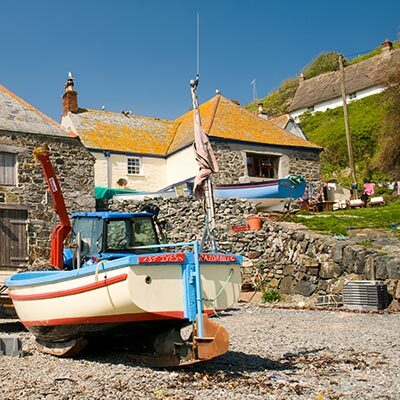 South Devon awaits you with its epic expanses of cliff walking alongside lush farmland, interspersed with rivers and estuaries dotted between brightly coloured fishing villages. This area is of particular interest to military enthusiasts also, with a chance to visit the training grounds of Torcross and Slapton Sands. Only a few days to spare ? 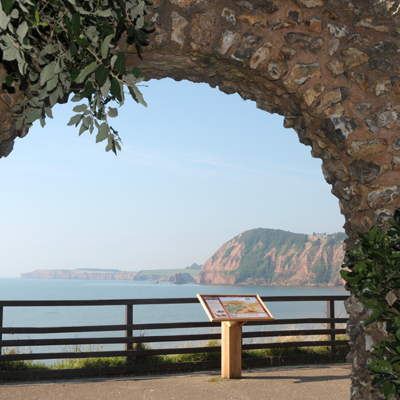 Well why not visit the English Riviera and walk this short journey between Brixham and Exmouth. Leaving the bustling port of Brixham, follow the path along the Victorian promenades at Paignton and Torquay, moving up onto red sandstone cliffs...to Babbacombe with its Cliff railway...then through woodland and rolling fields passing Teignmouth and Starcross before ending your journey at Exmouth. 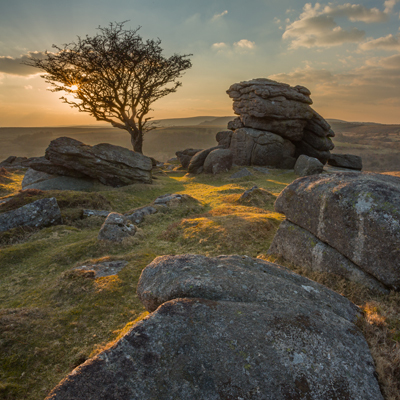 Begin your journey on the coast of East Devon before going back in time entering the renowned Jurassic Coast of Dorset on a lovely and rewarding journey with ever changing scenery and contrasts. 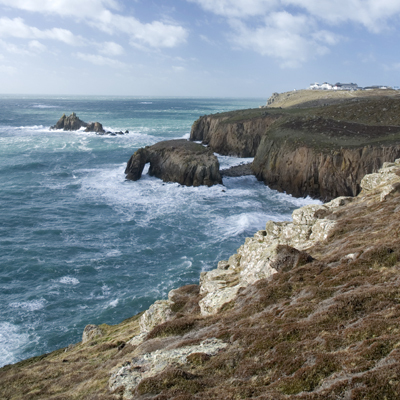 Walk along cliff tops above rocks dating back 250 million years, explore small coves and quaint fishing villages and perhaps find your own fossil ! Starting in the literary town of Lyme Regis, immerse yourself in millennia of geological history. 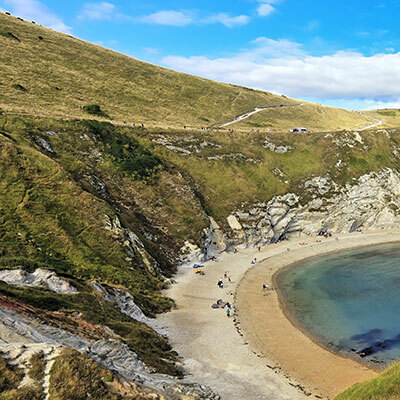 Climb Golden Cap, Southern England’s highest point and see the coastline beckoning you onward to inland lagoons and high banked shingle beaches. 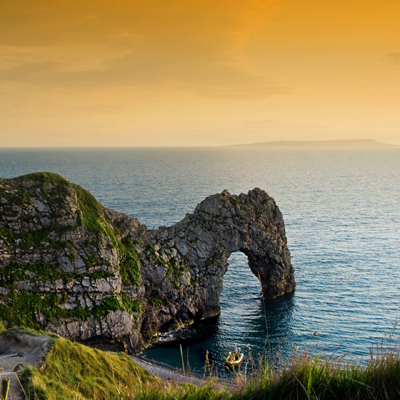 The Jurassic Coastline continues to astound with hidden coves, beaches and the world famous Durdle Door. Explore the Isle of Purbeck with its historic castle and fortifications before you end your journey at South Haven Point. 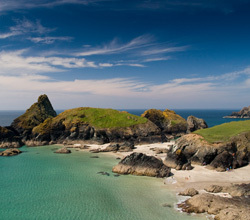 At 630 miles long, the South West Coast Path to most is considered too much to walk in one go. But, if you'd still like to complete it and have over 2 weeks spare you may want to consider walking 1/3 of the path. Part 1 is from Minehead to St Ives which can be done in as little as 16 days. Part 2 is from St Ives to Plymouth which can be done in as little as 13 days. 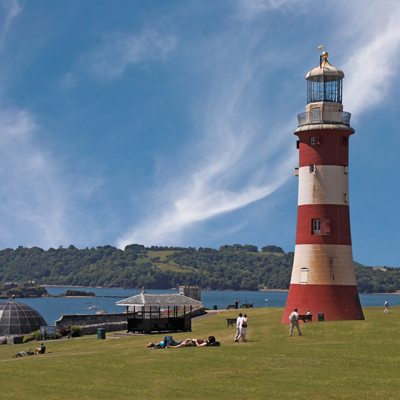 Part 3 is from Plymouth to Poole which can be done in as little as 11 days. 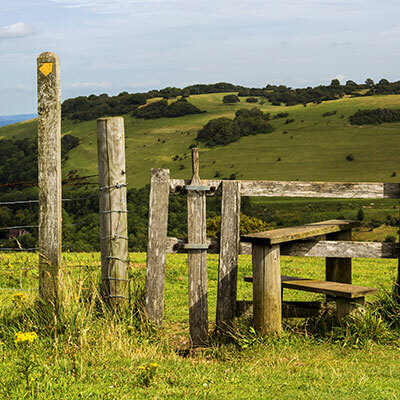 One of the prettiest walks through the green fields and rolling Cotswold hills of South England. 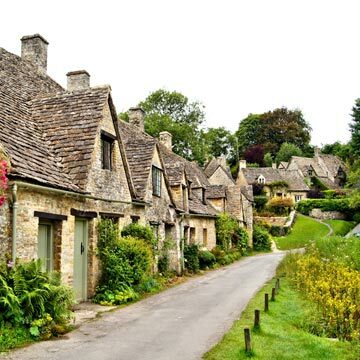 Picturesque , welcoming villages with thatched houses await you as you walk through many periods of history on this landscape, ending in the Roman city of Bath. 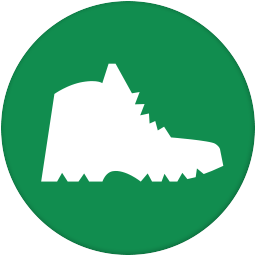 The first National Trail in Wales and stretching 180 miles (290km) from St Dogmaels in the north to Amroth in the south. 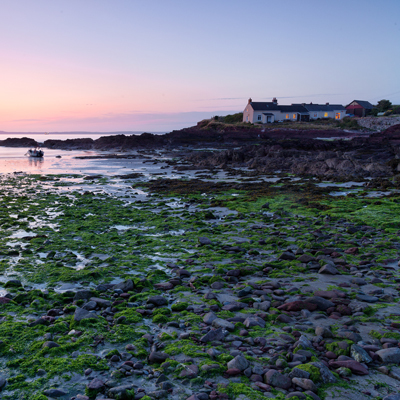 Secluded beaches, sleepy fishing villages and castle ruins and epic landscapes are just a few of the sights you will see on this walk which follows some of the most spectacular coastal scenery in Britain. This walk will leave you invigorated, revived and will revitalise the senses. 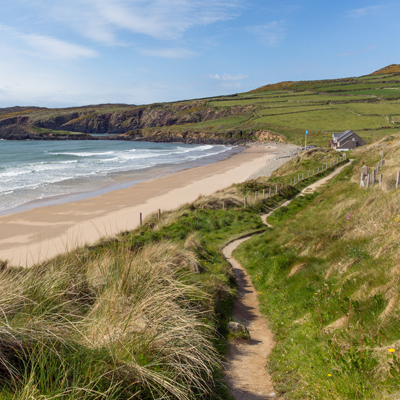 A challenging but wild and beautiful journey along spectacular cliff tops with superb views, along glorious sandy beaches and through unspoilt Welsh countryside. 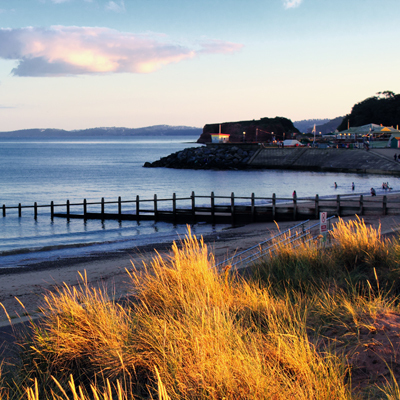 Stay overnight in delightful seaside towns and old fishing villages. See the amazing blowhole at the Witches Cauldron, ancient Neolithic chambers and standing stones,and the cathedral in unique St Davids the 'smallest city' in the UK. 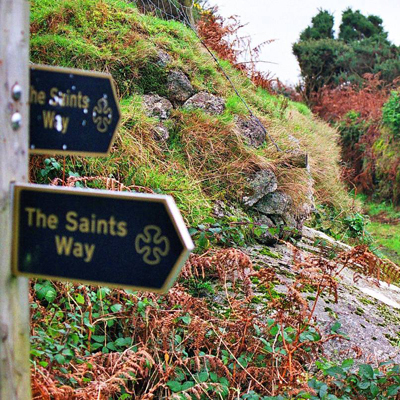 Arrive in the 'tiny' city of St Davids, explore the cathedral then rise the next day to start walking on this lovely journey over wonderful cliff tops and along secluded golden beaches; through Welsh woodlands to the pretty harbour at Solva. 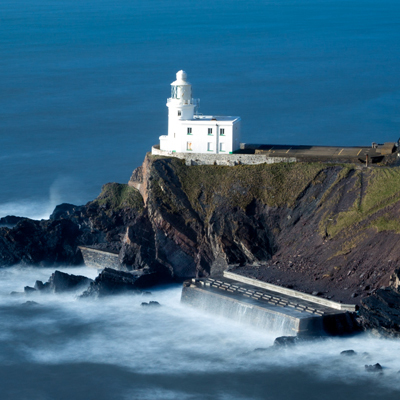 With amazing views over the islands of Ramsey, Skokholm and Skomer home to many kinds of seabirds such as Puffins, Kittiwakes and Guillemots, the trail continues along this beautiful coastline before arriving at the bustling port of Milford Haven. Starting at the bustling coastal port of Milford Haven with much naval history still visible the trail moves through Pembroke, where the remains of the Norman invasion can be explored at Pembroke castle, mixed with views of the industrial present. 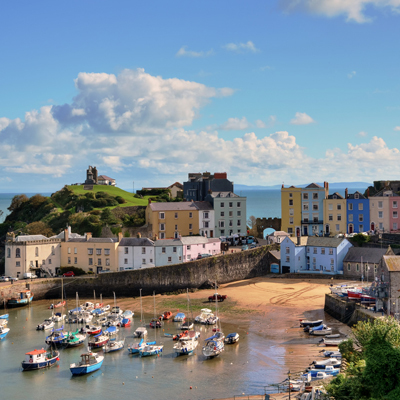 Discover the quaint village of Angle,iconic picturesque Tenby; Manorbier Castle and Bosherston Lily ponds. Witness the abundant wildlife and seabirds, with the ever present sound of the waves crashing below, this is a journey with such variety it cannot fail to impress. 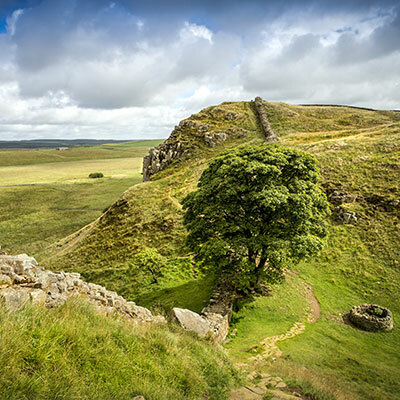 A spectacular and varied walk starting from St Bees on the North East coast of England crossing through the three iconic National Parks - The Lake District, The Yorkshire Dales and the North York Moors, ending your journey on the North Sea coastline at Robin Hood’s Bay. 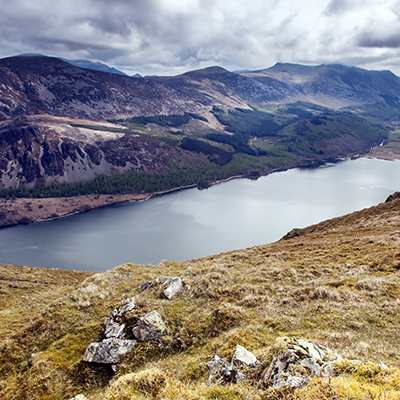 A 'must do' trip for any walking enthusiast – strenuous but immensely rewarding. 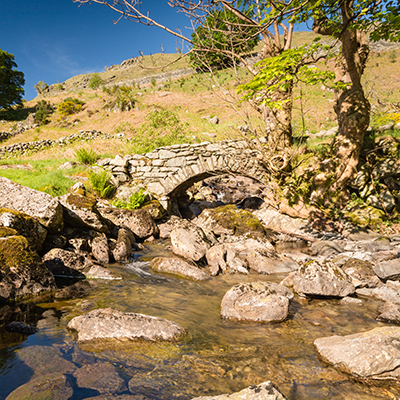 The West section of the Coast to Coast offers the opportunity to explore the stunning Lake District in all its glory, allowing you to break the Coast to Coast walk into a shorter style break. Challenging daily terrain rewards you with open skies, breath-taking views across millennia of geological formations and native wildlife. 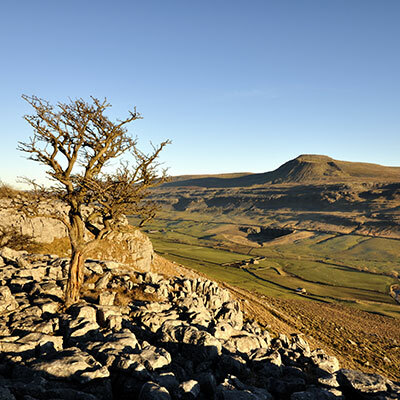 The East section of the Coast to Coast Walk gives you the opportunity to explore both the Yorkshire Dales and North Yorkshire Moors National Parks. A superb but challenging walk through the uplands of the Pennines across unique dales and windswept moorlands takes you onward to the North East coastal town of Robin Hood’s Bay. 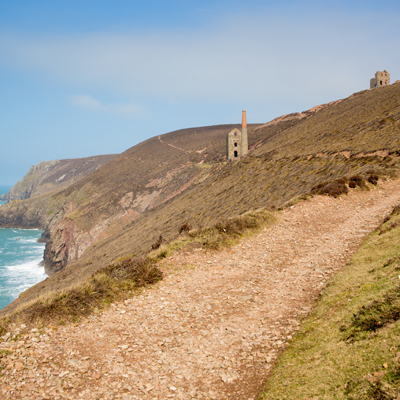 A stunning walk around the Penwith and Lizard Peninsulas of West Cornwall. This really is Poldark and Rosamunde Pilcher country, with a lot of filming done in this area. 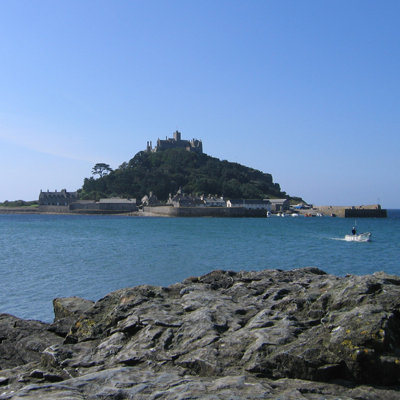 This dramatic walk explores many well-known landmarks including Lands End, The Minack Theatre and Marconi Telegraph Museum before reaching Penzance and Marazion, home to the iconic St. Michael's Mount. 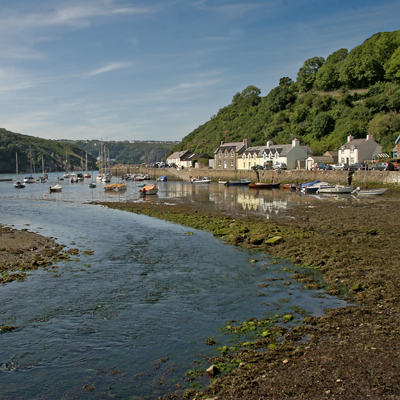 From here walk the rugged cliff tops and pretty coves hiding the fishing villages on the stunning The Lizard peninsula, to walking through ancient woodland surrounding the Helford River before reaching your destination in the vibrant harbour town of Falmouth.